Infra-red is part of the electromagnetic spectrum between visible light and radio-waves. It is invisible to the human eye but it's heating effect is dramatic. Infra-red heating has the ability to heat people and objects directly, without the need to heat up the air in between. What is the difference between Infra-red heating and hot-air heating ? Infra-red has the ability to heat people and objects directly without having to heat the air up in between. Hot-air, on the other hand, has to be first heated by a remote source, blown into a space before heating people or objects up indirectly. This indirect way of heating is extremely inefficient. No. Infra-red is purely a heating effect. There are no harmful rays such as ultra-violet or micro-waves involved. Shorter wavelengths also emit part of the visible spectrum (e.g. all the colours of the rainbow). Because of this, commercial heaters are fitted with ruby, amber or gold filters to block out most of the light but the Infra-red heating effect is not affected. For large industrial systems, shrouds are used to enclose the heating elements and stop direct viewing of the elements. Is Infra-red classed as 'energy efficient'? In general - Yes! Heat transfer of Infra-red is far more efficient than conventional hot air heating. Conventional heating requires a heater which will first warm the air an the air, in turn, heats objects and people. The losses associated with this type of heat transfer are quite large. Infra-red heats objects and people directly so heat transfer is far more efficient. The overall efficiency, however, will depend upon the wavelength of infra-red being used. The longer the wave-length the less efficient infra-red is. For this reason, short-wave or fast-response medium-wave is generally used where the efficiency is far greater than that of electric or gas hot-air systems. How does Infra-red heat people outdoors? How does electric Infra-red compare to gas heating? Gas heating in general is less radiant than the shorter wavelengths of electric Infra-red so tends to be less efficient. There are far more losses associated with gas heating and by-products such as carbon monoxide and water can be a big problem. There are no by-products associated with electric Infra-red and performance does not diminish over time. Gas systems, in general, require regular specialist maintenance which can be quite expensive. Electric infra-red requires little or no maintenance by comparison. How can Infra-red help me with the climate change levy? The climate change levy effects any business that uses energy. Many businesses continue to use traditional inefficient conventional heating so by switching to Infra-red heating usually means you will save energy. Less energy means less tax so if you are working towards an 80% reduction in the climate change levy, the adoption of an energy efficient Infra-red system will significantly help towards reaching your reduction targets. Why is Infra-red so good at drying water-based coatings? All materials have their own absorption characteristics. That means they will absorb at certain wavelengths more than others. Water in water-based paints and lacquers tends to absorb at about 2 - 4 microns. 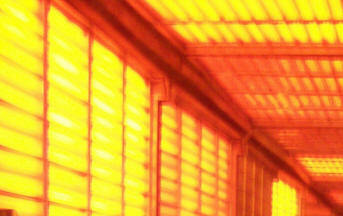 Medium wave Infra-red heaters have a peak wavelength of about 2- 4 microns. This means that the absorbency of water almost exactly matches the emission of Infra-red from a medium-wave heaters. The water molecules absorb the Infra-red rays before the substrate or the paint and begin to vibrate. They very quickly get hot and rise from the surface where they are carried away by an airflow. This rapidly leaves the paint itself on the substrate in a dry condition.